Certification according to Technical Regulations is mandatory not only for goods, but also for various stages of product life-cycle, from production to storage, export, transportation and recycling. Technical regulations limit export and import of goods that might be harmful for the environment or consumers. Since there are other ways to control the actual quality goods, the state requires manufacturers to confirm the technical safety of goods, which is why Technical Regulations have been developed. 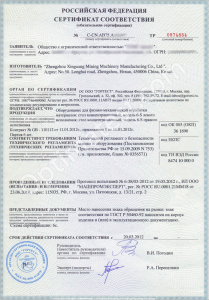 Technical Regulations certificate or declaration is mandatory at all stages; this document might be demanded by a number of authorities, including Russian customs. Technical Regulations consist of various standards that can also be found in other regulatory documents like GOST, sanitary standards, etc. Russian customs officers have a full right to request this document from the importer of the exporter of goods provided that the goods are being transported within the boundaries of the Customs Union. Technical Regulations certificate is valid for 5 years and is only issued upon proper testing of goods. The list of Technical Regulations that have already been put into force and that are still being considered by the Customs Union Commission is available on the official websites of the following authorities: Customs of the Russian Federation, Russian Agency for Health and Consumer Rights, Rosstandart, Customs Union and National Institute for Technical Regulation. If you want to avoid fines and bureaucracy importing and exporting goods to/from the Customs Union, delegate the procedure of certification to ROSTEST certification center. Our extended experience in conformity will allow you to save time and money.